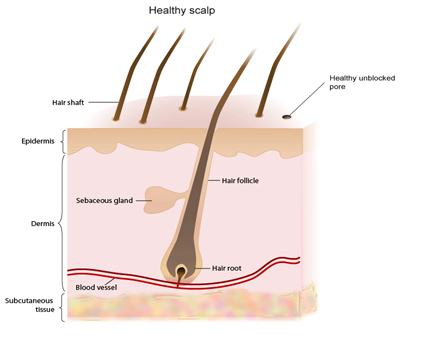 Why Why Clogged Hair Follicles Thin Your Hair and What You Can Do? Losing your hair to where it thins or you become bald does not have to happen. Just by understanding why your hair falls out and thins allows you to take counter measures. Discover what counter measures you need to take to keep your hair full, thick, or from thinning. There are various ways to keep your hair clean, shiny, and thick. If you still have hair and want to keep it or if your hair is starting to thin out, here are some hair remedies that you can use. I will cover only the first of the two items. Just like acne, your hair follicles can become plugged. In acne a plug follicle results in sebum and bacteria becoming trapped in the follicle, which leads to an infection known as a pimple. When a hair follicle becomes plugged on your scalp, the hair in that follicle becomes trapped and is prevented from coming to the surface. Over time, your scalp becomes smooth and you become bald or lose most of your hair. So the secret to preventing hair loss, thinning and balding is to prevent your hair follicles from becoming plugged. Once you know what causes your follicle to plug, you can avoid or counteract those conditions. Here is what causes your follicles to become plugged. Excessive release of sebum and scalp flaking mixing together to form a hard material that plugs up your follicles. It is well known now that excessive conversion of testosterone into DHT accumulates in the hair follicles and plugs. Knowing this you can use a variety of shampoos on your hair to dissolve this DHT. This keeps your pores open and your hair growing normally. You can also take capsules that prevent the conversion of testosterone into DHT. Most shampoos, conditioners, and hair gels are created using petrochemicals, un-natural additives, dyes, preservatives that are harmful to your hair and scalp. In addition, these un-natural hair product chemicals get into your pores and can plug. Once in the follicle, they also get into your blood and are harmful to your liver and the rest of your body. Some people have oily hair and some dry. When the hair follicle releases excess sebum it accumulates on the scalp. Here it will combine with dirt, dead scalp cells, and shampoo chemical residues. Using natural remedies reduces the amount of chemical available to combine with excess sebum and dead scalp cells. If you use any type of gel to style your hair these gels combine with sebum to plug up your follicles. To keep your hair and scalp clean and follicles open, use aloe Vera gel mixed with a few drops of jojoba oil. Buy aloe Vera gel, 99% pure and pure jojoba oil. Put some aloe Vera gel in your hand and add 4-5 drops of jojoba oil. Rub your hands together then rub this mixture into your hair. This mixture will keep your hair shiny and thick and your hair follicles open. Just making these changes to your hair care will go a long way in keeping your hair from thinning any further. Is Your Makeup Harming Your Fertility?